It’s a beautiful day in the middle of the cherry blossom, the sun is shining, the birds are singing, flowers are in full bloom – and your army of geishas is invading the imperial garden. Wait, what? Army of geishas? Invading the garden? How does that make sense? Officially, I don’t know, because the English rules omit the reason there are geishas in the garden. They might be invading, they might be putting towels on the best spots to reserve them like German tourists – hell, for all I know, the game might be about the Japanese Jack the Ripper trying to leave four victims in a straight line. Fortunately, French and German get a better explanation of why you do what you do in Okiya: it’s a poetic interpretation of the competition between two geisha houses for the emperors favour. Great, I was a bit worried about the Jack the Ripper option for a moment. To be honest, I’m blowing this whole missing sentence out of proportion, this one missing sentence is the only thing I found to complain about, the rules are easy to understand and the components are great as well. The tile illustration are inspired by the Japanese Hanafuda (“flower card”) game and beautiful in a minimalistic way, and the writing on some of them spell out a poem in Japanese when taken together. And if you happen to read Japanese, which I don’t, but the translation is in the manual. It’s those little touches that make me happy. The Flowers and the … birds? Anyway, now that you know why and with what you play, how about the how? Not a problem at all, because the rules for Okiya are as simple as can be while still making an interesting game. 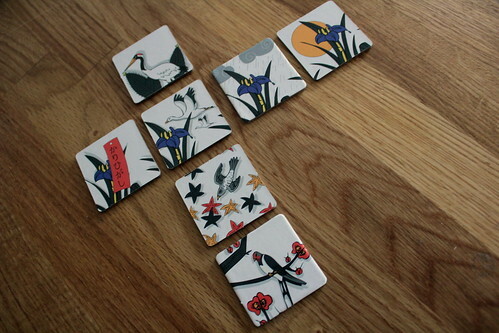 Each of the tiles in the random 4×4 grid show one plant (maple leaf, cherry tree, pine tree or iris) and one detail (rising sun, poetry ribbon, birds or rain). As there are 16 tiles, each combination exists exactly once. 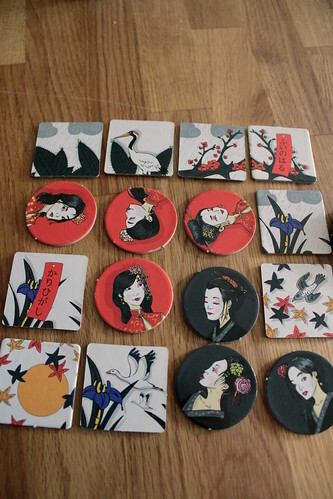 The first player may pick any of them and replace them with one of his geisha tokens. The next player is constrained in his decision now: he has to pick a tile with either the same plant or the same detail to place one of his geishas. His pick, in turn, restricts what the first player may do next. And so on, until one player wins by either having four of his geishas in a line, or in a 2×2 square, or by default because his opponent can not make a valid move. That’s it, all the rules for Okiya, no special cases or anything. The only thing we had to give a moment of thought was: what happens when all the tiles are gone? But even that is actually obvious, because the next player will be unable to make a valid move, so he lost. Like I said, the rules couldn’t be easier. Playing the game, on the other hand, is not as easy as the rules look. Thinking ahead is key, even if a game of Okiya takes eight rounds at most before the whole board is taken. Nevertheless, you want to build your own position with opportunities to score while preventing your opponent from getting three pieces together because the last, winning move is often hard to avoid. But position is not everything, you also want to watch which tiles are still in the game because a line of three helps you nothing if there is no way left to get to that last tile. I don’t want to mislead you about the strategic depth of Okiya, we are talking about a game that is over in less than ten minutes, after all. But for those ten minutes, you will want to concentrate. Or maybe for those thirty minutes, because the usual way to play is to two games out of three. The rules also suggest a mode where you score points based on how many tiles are left on the board when you win, but I prefer the two-out-of-three option because it saves you from counting points. In the final verdict, all this leaves you with a game that you learn in less than a minute, carry in your hand luggage, can play on the crappy, small fold-out tables on an economy class flight and can play for two hours without getting bored. Or you can play it for twenty minutes while everyone else finishes the game you were eliminated from. Okiya is a short game that you can play as a filler, but that you don’t play only as a filler. A game that forces you to concentrate, but only in short bursts. A game that briefly worries you about burying geishas in your garden. A pretty cool little game when all is said and done.